Some excerpts from the files. My scanner is not as broad as some of the pages are wide, so please forgive any truncated views. Darlene, the collection spans 40 years and is mostly pre 1980's collectibles. This posting is from only one binder. There are many! Tks for confirning Steve. I could spend a very long time looking through your collection! And regarding Withybush Crispin and way back in 1957 when he was entered at Crufts....here was the catalogue....enjoy the ads! The Museum is open to all, by appt. only. If I'm ever in your neck of the woods Steve....I'll call ahead for an appt (or at least to give you fair warning & a heads start)! You're not scaring me, all are welcome. 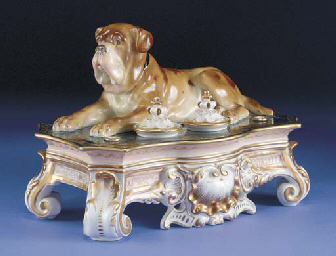 The lower right photo is a closeup of a Mastiff figure, which is part of the pair located on the fireplace surround (lower photo). Thank you Steve! I LOVE the Broomcourt Mastiffs, especially Romeo and love Maximize Colossus! Post #22 1st photo is of Thunderhill's Abbess. Note that the tip of her tail is missing, due to happy tail. This unfortunate event ended her show career. Tks Steve! Luv these pics! In regards to the above letter from D.B. Oliff, I had received a pedigree from Ed Gerace (Greenbranch), which had two fawns producing a brindle (Micawber). This I found disturbing and wrote to Oliff in order to clear the issue. In my youthful exhuberance, I had expressed this concern in a NEMF Newsletter, thinking that many pedigrees might be in error. Once the matter was corrected, I then followed up with a retraction of same, in the next NEMF Newsletter. ...As we again gaze upon the picture, a story recurs to our memory, which was related to us some years ago during our rambles in southern Germany, and which, if we are not greatly mistaken, has afforded Lessing the hint out of which tills delightful composition has arisen. The story is connected with one of the most beautilul valleys in Franconia, situated in the midst of wooded mountains and romantic cliffs, and in which stands the picturesque ruins of the ancient cloister of Eberach, formerly one of the most wealthy in the holy Roman empire. "Father Clement gazed for a moment on the pale features of the stranger, and with a loud cry of joy threw himself into his arms; while the young ministrant, the only witness of the scene, wondered at the strange likeness between the ascetic countenance of the monk, and the pale and care worn features of the soldier. "'Yes, I am Frederic,' sobbed the monk, embracing his long lost brother. "Frederic, who still lives, to repent the headstrong passions which drove his brother to attempt a murder, and to wander like Cain, a fugitive upon the face of the earth; and who as father Clement, has long bid farewell to the pomps and vanities of a sinful world. Burchard returned his brother's embrace, and related how, haunted day and night by remorse for his supposed crime, he had in vain sought death upon the field of battle, and had at length felt himself irresistibly impelled to return to the place where he had shot his brother, in order to make a fancied atonement for one crime by the commission of another. We shall make no attempt to describe the strange mixture of feelings winch pervaded the breasts of the two brothers at this unexpected meeting. Burchard returned with Frederic to Eberach, and on the following day was admitted into the monastery as a novice. Renewed affection replaced the painful feelings under which the two brothers had labored for so many years, and they passed the rest of their lives respected by their clerical brethren and revered by the neighboring peasantry. Frederic, or as he was called in the monastery, Clement, became eventually Abbot of Eberach, and after a lapse of more than thirty years gave the last absolution to his brother, and accompanied his remains to the rave [sic. Perhaps "grave"? T.S-Z]. He survived Burchard many years, nor did he quit the world which he was supposed so long since to have forsaken, till he had attained the unusual age of ninety years." All of the above, is but a partial sampling of the collection. I wanted those who may not be able to view it in person, due to logistics & time restraints, to at least be able get a chance to see some of the items in the Mastiff Museum. I hope you all have enjoyed the internet tour and if you did, the many years it's taken to accumulate this Mastiff cornucopia makes it all worthwhile! If there are any questions about any image posted, just ask. I suspect the Mastiff in the last image in post #42 was Crown Prince. This is the first time I noticed this thread. I will have to schedule an appointment. We probably live only 70 or 80 miles apart; as the crow flies. A close up of one of the end castings from the fire surround. Great pics and write-ups, Steve. 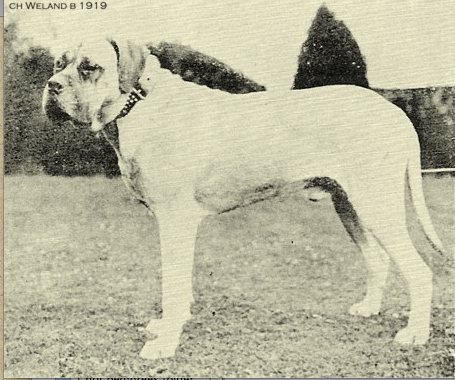 People might be interested to know that the dog featured in the last of the first set, Glad Eye of Leetside, though he didn't produce any offspring, was the fuii brother of a very important Mastiff, Ch Weland. Not only was he behind the Deleval and Goring kennels, but he was the great, great, great grandsire if three of the bitched that went to America in the 30's, Maud of Hellingly, Broomcourt Nell and Millfold Lass, and two of the dogs, Roxbury Boy and Duke of Hellingly. Even more importantly he was imported to North America himself and used by the only active North American breeder of the time, Canadian C. W. Dickinson. I suspect Dickinson himself imported him. 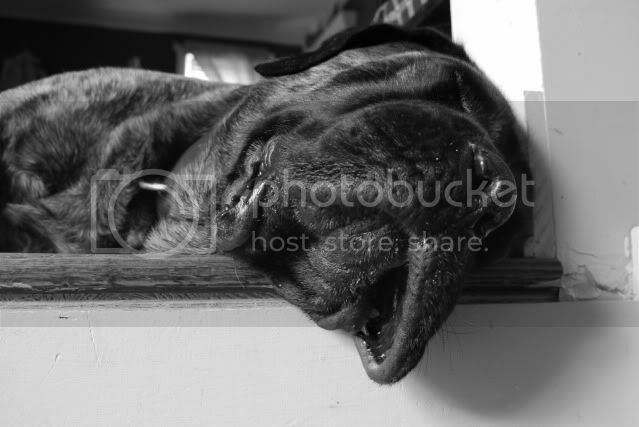 Two of his offspring were bred together to produce Betty, who is behind every North American Mastiff until the 30's exports arrived.